Everything involving Dee Dee's romp with the dolphins has been a learning experience. If you still haven't read her tale, you can see her post Swims With Dolphins. And be sure to checkout Lessons Learned. 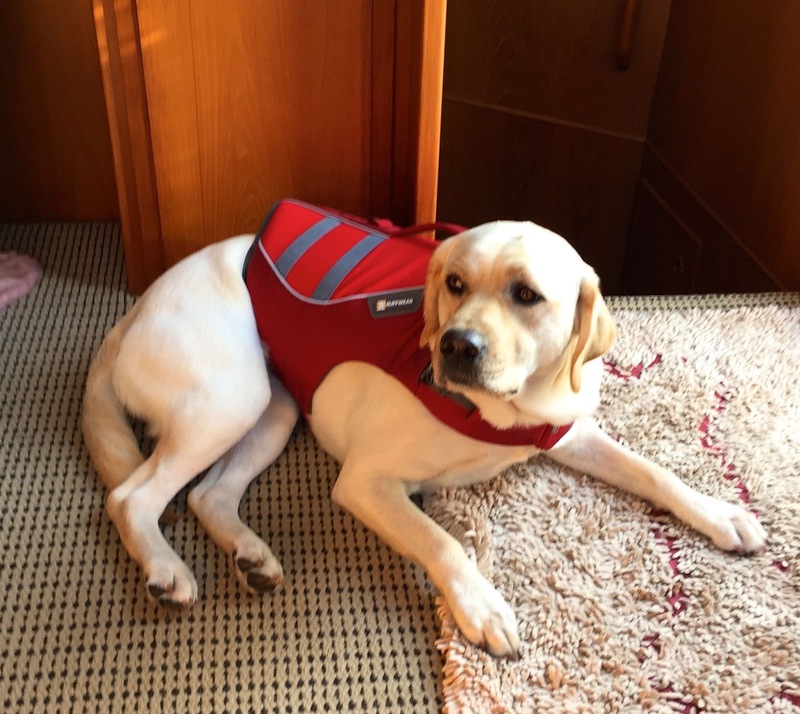 In our quest to learn from our experience and provide better safety onboard for our crew, we have spent the intervening months testing a variety of dog harnesses. First, I want to state that any of the harnesses that we tested served the function of lifting the dogs and were better options than the Kong harness which failed us with Dee Dee. Second, there is no such thing as a perfect harness that will work with every dog. Like people, dogs come in all sorts of shapes and sizes. 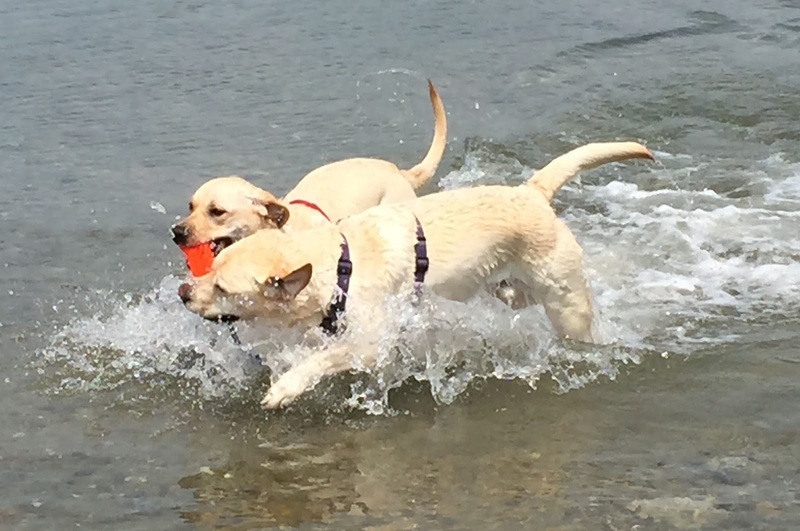 There are many factors involved that are personal to your canine crew member, water skills, for example. Fortunately, there are lots of harnesses on the market so you are sure to find something that will work for you. As I've stated previously, the safest option in all cases is a quality canine life jacket and both Kurgo and RuffWear offer these. 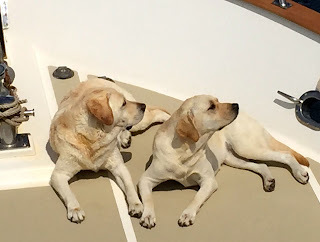 For us, we wanted a more comfortable option for our crew which are excellent swimmers and spend extended time underway including occasional overnight passages. What I hope to provide here is a framework you can use to seek out the solution that is best for you and your precious crew. 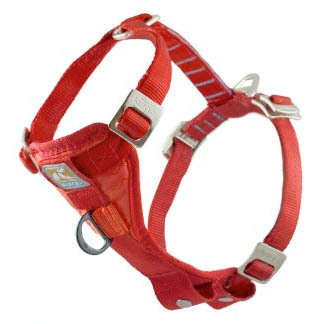 Following are the components you should look for in a safety harness. The belly plate gives you a firm foundation for lifting the dog making it easier. 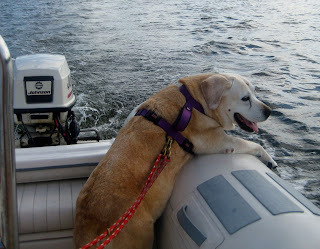 It distributes the dog's weight so you're not putting too much pressure in any one place. Lifting even a small dog from the water back into a boat creates quite a force on his body. I believe a good belly plate makes lifting not only easier but safer as well. The safety loop is an important feature for several reasons and it really does live up to its name. Bringing a dog back to the boat from the water is not the same as grabbing the harness while walking. 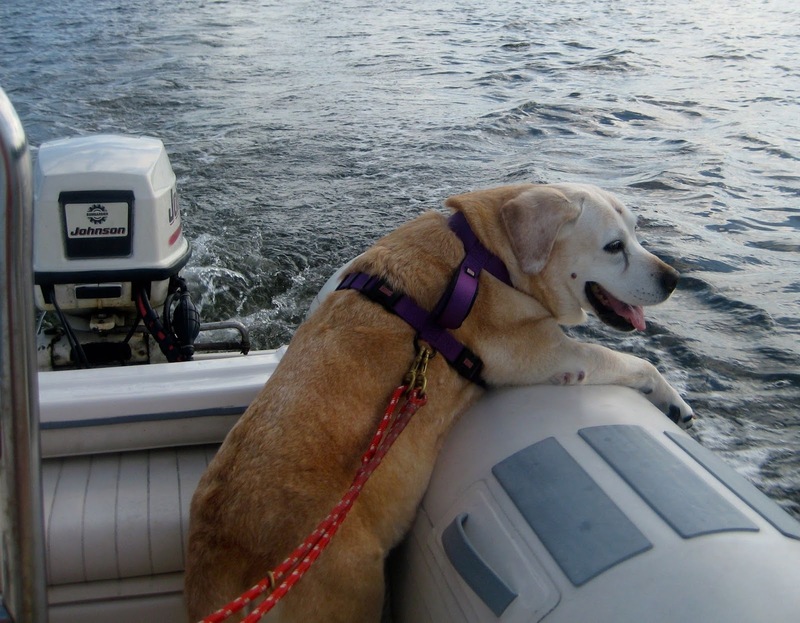 The safety loop lets you use a boat hook to catch the dog and bring it up to the boat. It then gives you a good target to grasp and lift the dog. It also offers you an easy way to control the dog when needed. Having the loop positioned between the shoulders will make lifting easier. A dog trying to get back into a boat will typically try to climb in with his front paws. This was what Dee Dee did when she returned to the boat. Having the handle placed between the shoulders allows you to work with that motion to bring the dog in. 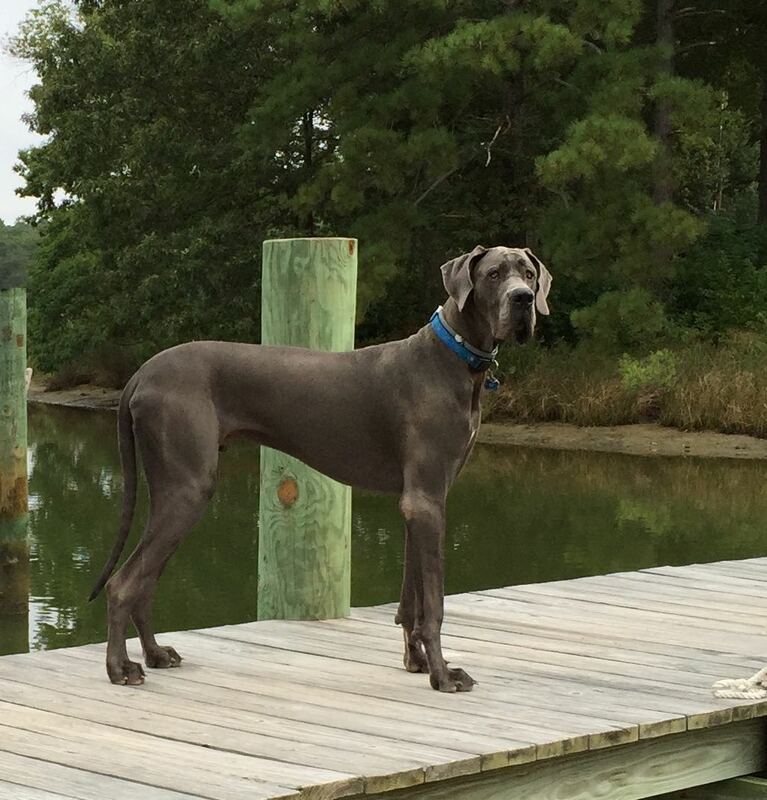 Consider all factors about your dog and not just weight and girth. Factor in the dog's length and where that girth strap will fall. Is your dog deep chested, like ours, or more barrel shaped? Find out the length of the belly plate to determine where it will rest on your dog's torso. You want something that fits snugly with minimal shifting, yet is comfortable during long term use. Good padding, especially at pressure points, is also important. Dee Dee's medium size harness on the left. Dylan's large on the right. As I discussed in the Size Matters entry, we had some challenges fitting Dee Dee in a harness due to her small size. The picture above shows the difference in length between the medium and large size belly plates on the Tru-fit harness. By swapping the medium girth strap for a large one we were able to make a perfect fit for Dee Dee. Note the two snaps at the back of the belly plate. This allows some even finer adjustments should you need it. Make sure you can return the harness if you do not like the fit. And if you are unsure order multiple sizes. It is important to take care in finding the proper size and then fitting it to your dog. Remember, he will most likely be wearing the harness for many hours. Following are the conclusions we came to for the harnesses that we tested. Remember, this is based on our very special crew members, so the specific harness we selected may not be the one for your precious bundle. My hope is that you will find the process we went through helpful. 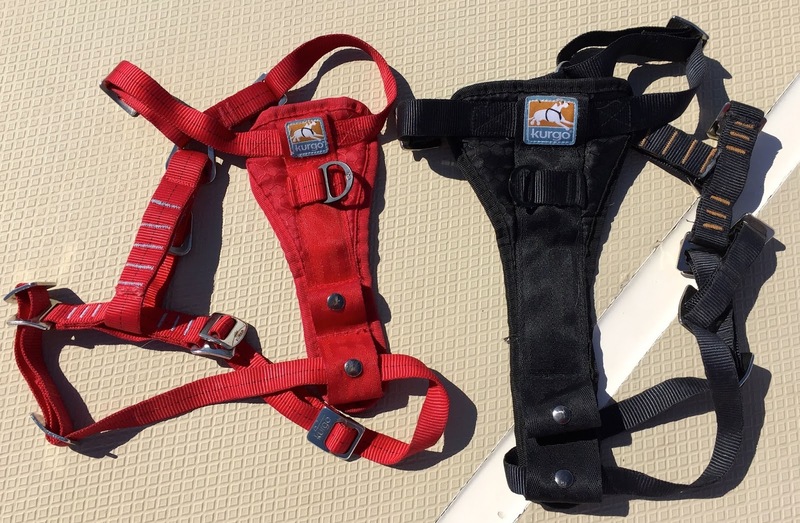 This well made harness has two lifting straps that did work for both Dylan and Dee Dee. However, their placement near the rear legs made the lifting more difficult. This may well be less of an issue with a smaller dog. Dylan and Dee Dee weigh 64 and 54 pounds respectively, so I definitely needed some help lifting them. The belly straps are well padded but the harness lacks a belly plate which better distributes the dog's weight when lifting. While this harness worked fine, I think there are better options. "...there are no plans to add a handle to it in the future. We believe that the harness itself functions as a handle and therefore, that need is being met for most users. I understand that for pulling a dog out of the water, this is not ideal. Unfortunately, we are not able to meet every need within a single product." I hope they'll change their mind in the future or have a way to add a loop. I like this harness a lot as well. It is my favorite of the ones we tested. It has a very large belly plate, the least amount of webbing to stretch, and a large safety loop that sticks up nicely on Dylan's back. If we had been able to fit this harness to Dee Dee it would have been my single choice. This is also a good harness with its only drawback being webbing on the back rather than a back plate. However, this did not seem to impact the ability to lift. This harness has the added benefit of being a crash-tested car harness. And it has the maximum adjustability of all the harnesses we tested. This turned out to be the best option for Dee Dee. 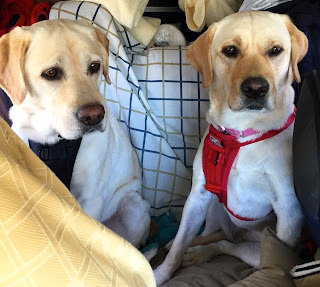 Dylan and Dee Dee test the Tru-fit harness in the car. If you do not have a car harness, this is a good choice for a harness that can do double duty or as an addition to the safety harness you use onboard. The Tru-fit harness is also a great option if you have a dog that is hard to fit. I have been communicating with Kurgo about the corrosion issue and they are looking into offering an option with stainless steel buckles. I for one would be happy to pay more for a longer lasting product. Of course, they need to determine what the added cost would be and if the market is big enough to make the design change. As the crew was working on this series, we discovered a version of the Tru-fit harness that has plastic clips for the girth strap. As this is the most manipulated strap, this should certainly help the rusting issue. I have obtained one for testing (sorry, Dylan and Dee Dee, you're just gonna have to do some more swimming...). Note, this harness is not a crash-tested restraint. The crew will let you know what we find in a future posting. The hard work began. 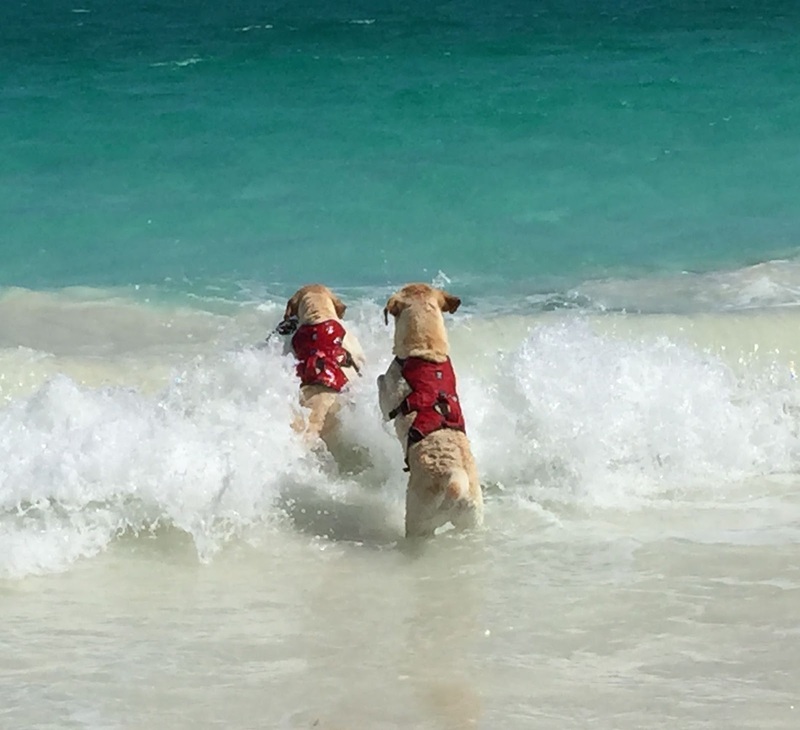 The crew faced hours of swimming and running and bumper retrieving from the Bahamas to Maine with numerous stops in-between. It was an arduous task but we are happy to report that their performance was exemplary. 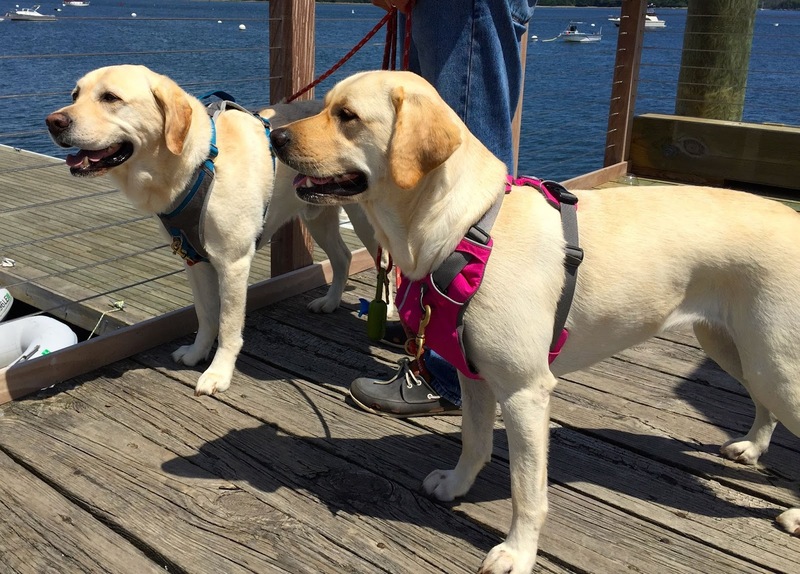 We now had three harnesses each for Dylan and Dee Dee to test. Dylan had the RuffWear Web Master, the Kurgo Pinnacle, and the Kurgo Tru-fit. Dee Dee had the RuffWear Web Master, the RuffWear Front Range, and the Kurgo Tru-fit. See Size Matters for what we discovered about fitting the harnesses. While Dylan thought it would be a good idea to do a live test and throw Dee Dee overboard three times on the ICW, we thought there was a better way. We decided to mimic Dee Dee's half hour swim by bringing the crew to whatever swimming opportunity we had nearby for at least an hour of swimming and retrieving. Dylan and Dee Dee were happy to oblige and performed all of their testing with gusto. Unlike the Kong harness, all of the harnesses we tested were a combination of webbing attached to plates of material. 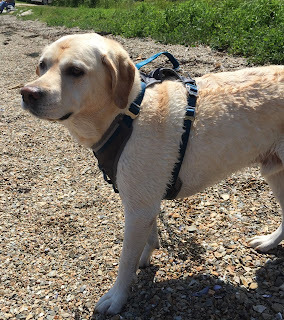 The non-waterproof webbing on all of the harnesses did stretch a bit during an hour of strenuous swimming. However, the material did not appear to stretch. 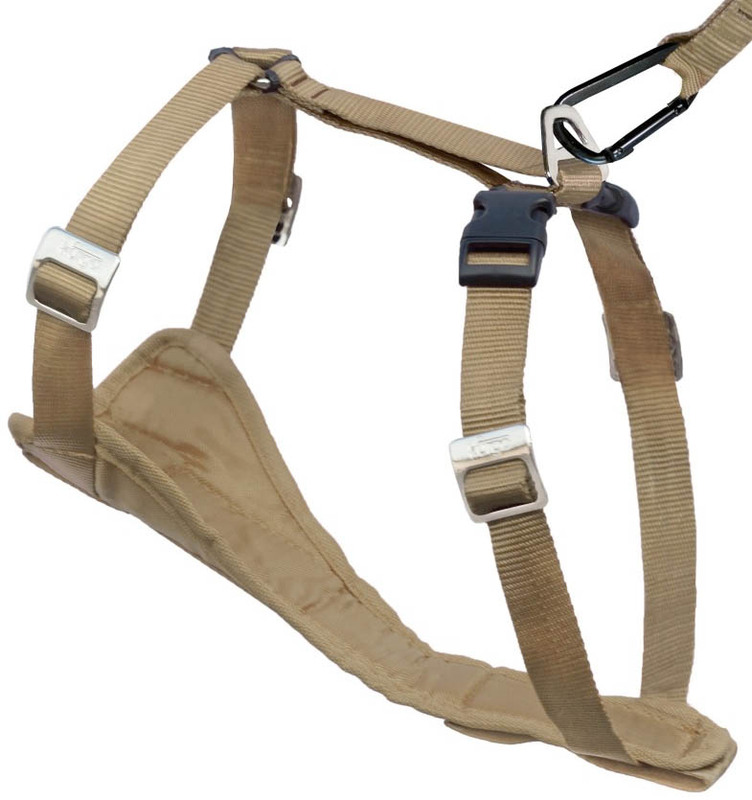 We found the overall stretching wasn't enough to compromise the harnesses for lifting. Here's a run down on each harness. The Web Master harness was designed to assist a dog's back legs up and over obstacles when they are hiking/climbing with their owners. It has 3 straps and two handles. One handle centered on the back near the rear legs for lifting the dog up and one on the far back for helping the back legs get over things. The Web Master has a small padded chest plate but lacks a full belly plate. I hoped that the extra strap would mean a more secure fit but immediately ran into a problem fitting the back most strap. You can find out more about this in the Size Matters entry. We tested the Web Master harness on both dogs. While we were able to lift them using the handle on the back, we found the lifting a bit awkward due to the placement of the handle. The dog's head tended to tip forward requiring more strength and maneuvering to lift them. Even with smaller Dee Dee, it was difficult to lift her front paws up. A look at the canine life vest shows the handle between the shoulder blades. This allows you to lift their heads up and out of the water. With the PFD strap I was able to easily lift Dylan's front paws off the deck. 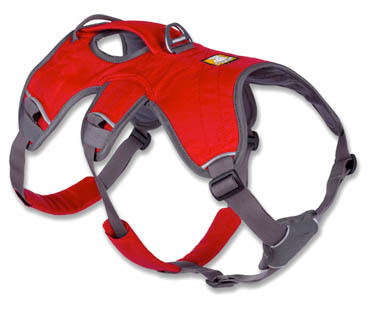 This harness is designed as a walking harness and it comes in a variety of colors. When you have more than one dog, it is extremely helpful to have different colors for each dog, especially when they are different sizes. The Front Range performed very well even after many hours in the water. When lifting Dee Dee, the belly plate gave a solid base, keeping her stable. My only complaint is that there is no safety loop on the dog's back. Having a loop on the back would make the harness much easier to grab and hold with a boat hook. It was more difficult to grasp for lifting and not simply because it is wider than the traffic loop. It also requires you to slip your hand between the harness and the dog. Remember, you want the harness snug so there should be minimal room between the harness and dog. Having a loop that sticks up is far easier to grab in an emergency. 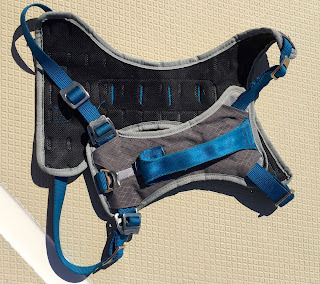 The Pinnacle harness had the same qualities I liked in the Front Range harness. Most of the harness is made of a breathable ripstop fabric with minimal webbing. Notice the large belly plate which aids in lifting by distributing the weight. 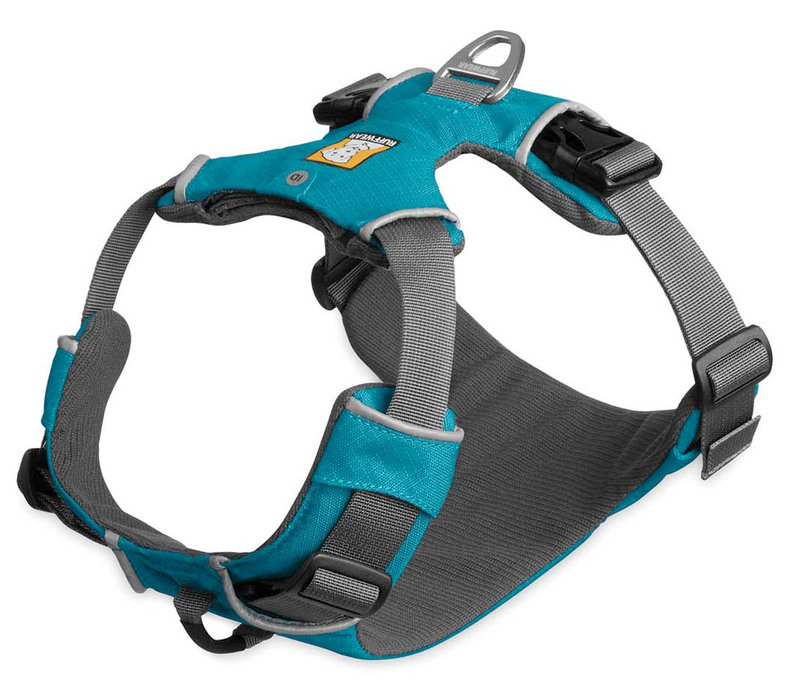 The harness only comes in one color on the Kurgo website. When I inquired about a different color I was told that the Journey Harness sold at Petco was identical and came in other colors. So if you have more than one crew member, you may want to look there. The big safety loop is an easy target. But my favorite part of this harness is the large safety loop on the back. It offers a great target for the boat hook, a firm place to grasp and pull the dog in, and an easy way to control the dog on the dock or in traffic. The size of the loop makes it very easy to grab and lift the dog. It is positioned right between the shoulder blades so that you are pulling the head upward. This harness is Kurgo's car crash-tested harness. If you sometimes travel with your crew by car, you need to have a crash-tested harness to keep them safe. In our 20 years as volunteer EMT's, we have attended accidents where the human was belted and safe but the dog was injured. They are subject to the same dangerous forces in a car accident that you are. You can watch a video on the Kurgo website of the harness being tested with a canine crash-test dummy. The safety loop is easy to grab. The Tru-fit harness has a broad belly plate to distribute the dog's weight when lifting. It also has the all important safety loop on the back, positioned between the shoulders. There is only webbing on the back which meant it stretched more than the Pinnacle but we were still able to lift the dogs easily. 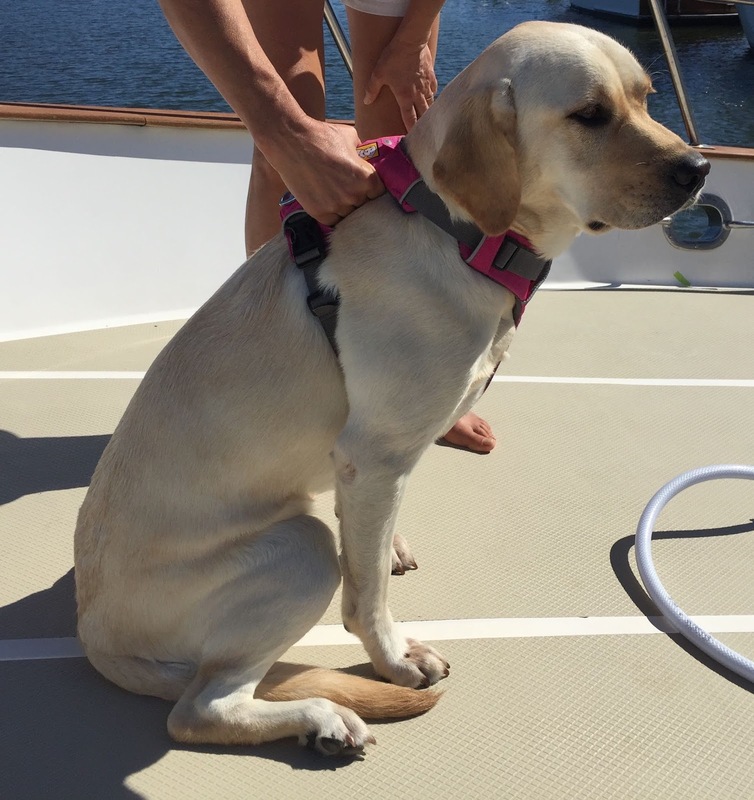 The Tru-fit harness also offered the most flexibility for finding a good fit for Dee Dee. One issue I had with both of the Kurgo harnesses was that the metal clips began to rust after a few months of use. To be fair, I was warned of this when I explained how I would be using them. They are made of steel rather than stainless steel. After several months of heavy use, the most manipulated set of clips on the girth strap were showing signs of corrosion. The other clips are fine. We have certainly put them to more of a test during that time than is typical. 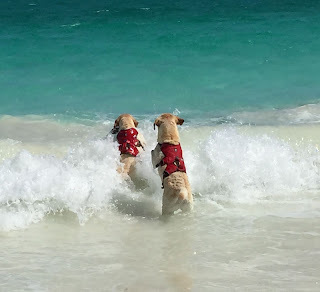 The crew spent many, many hours swimming in the harnesses, mainly in saltwater. Of course, the goal of a real safety harness is for it to never end up in the saltwater. Still living in a saltwater environment means that it will eventually rust. 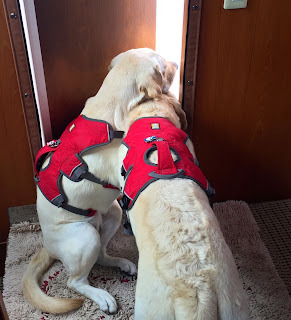 In the next and final entry, I will summarize what we learned and offer some suggestions for finding the best harness for your canine crew. Our first task was to sort through the various options for dog harnesses and there are quite a few. Many of you sent us suggestions which was very helpful. 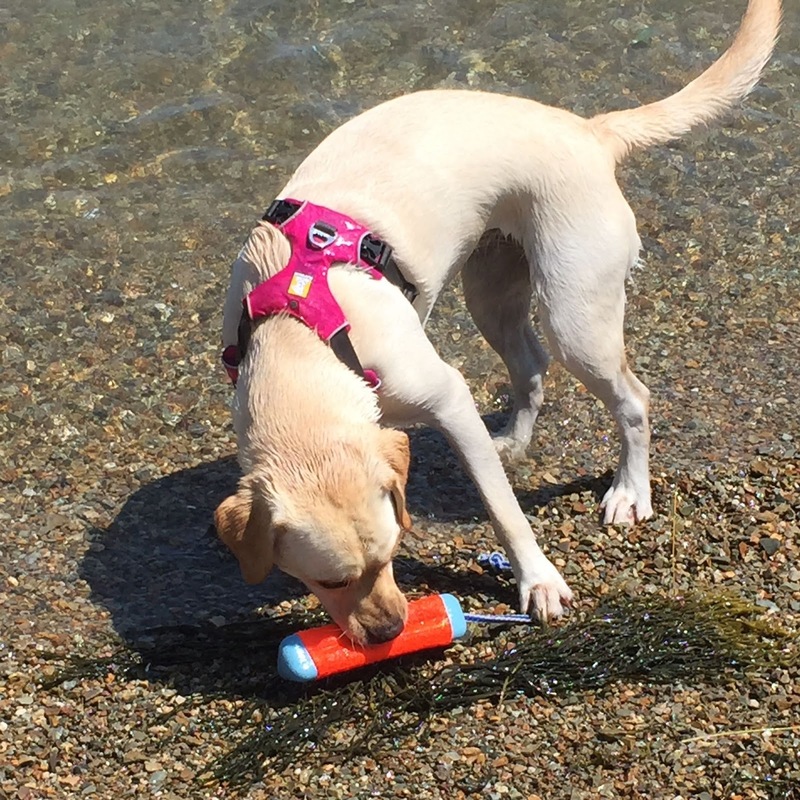 I spoke with several manufacturers and we decided to test several options from Kurgo and RuffWear. I believe both are committed to providing optimum solutions and were open to hearing our honest feedback. 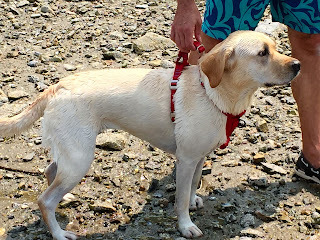 We tested 5 different harnesses including the original Kong harness that had failed for Dee Dee. Here is a brief rundown. Dylan in his Kong harness. The Kong Harness was our go-to harness for years and the one we wrote about in Dyna and Dylan's most popular blog entry ever, All That Dog Gear. Check it out for more info about the gear we use onboard for the crew. The main attraction for the Kong harness was the large "traffic loop" on the back which made grabbing it by hand or with a boat hook easy. We had a Kong harness for Dylan and one for Dee Dee. I liked the Kurgo Pinnacle Harness as soon as I saw it because it had a large padded chest plate and back plate, and a traffic/safety loop like the Kong. With less webbing and more of the mesh material I felt it would be less likely to stretch. We had one for Dylan and one for Dee Dee. 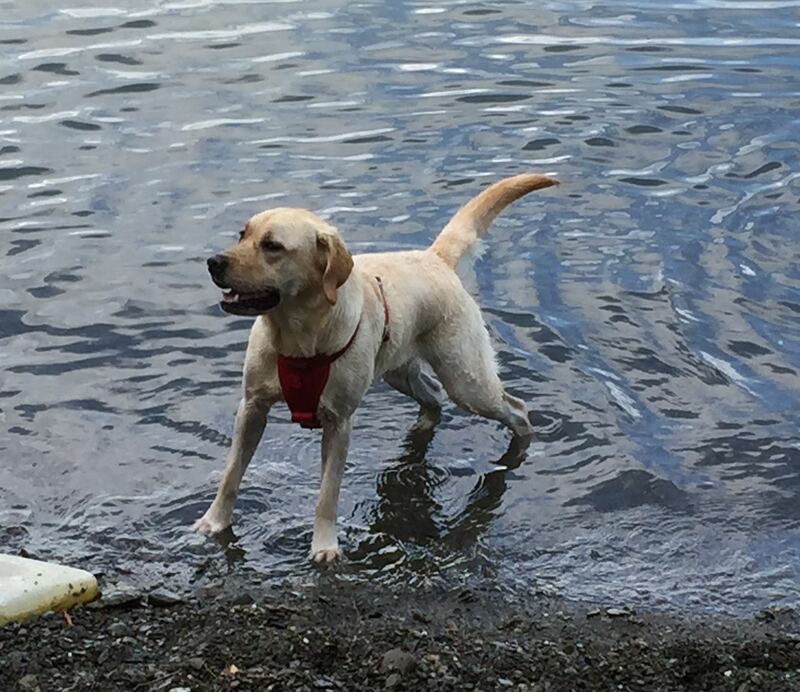 Dee Dee in her Kurgo Tru-fit harness. I wanted to try the Kurgo Tru-Fit Harness because it is also crash-tested as a car harness. 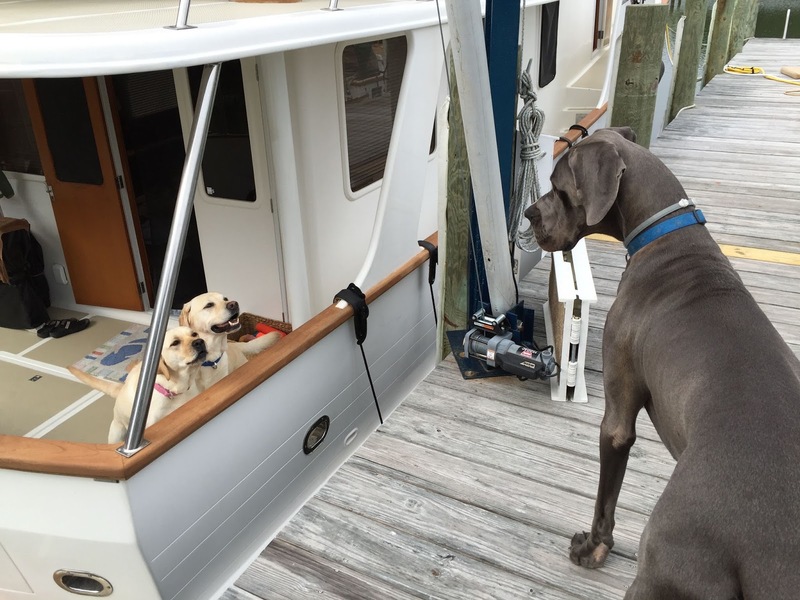 Living on a boat makes one really appreciate any item that can do double duty. We never have the crew in a car without being strapped in for safety. The Tru-Fit has a very broad chest plate and a strap running down the back. It also has a traffic/safety loop. We had one for Dylan and one for Dee Dee. The crew in their RuffWear Web Master harnesses. The RuffWear Web Master Harness was interesting because it had two different safety loops on the back. 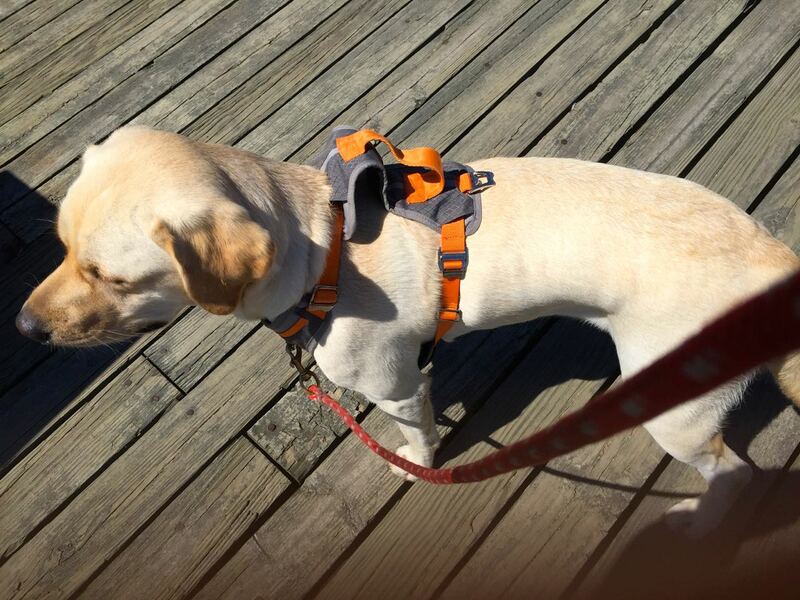 This harness was designed for hiking to allow the owner to help the dog scramble over obstacles. I also found the 3rd strap interesting as I felt it might afford more security in a lifting situation. We had one for Dylan and one for Dee Dee. Dee Dee in her RuffWear Front Range harness. I originally tried the RuffWear Front Range Harness for Dee Dee to help train her to pull less on normal walks. But harnesses don't provide enough correction for a pulling dog and so I decided to try it as a boating harness instead. This is really more a failure of us than the harness - we have spoiled dogs. The Front Range comes in a lovely shade of pink, even if she is a Tom-boy. We began acquiring harnesses and realized that the first issue was sizing. The fit had to be both comfortable and secure. 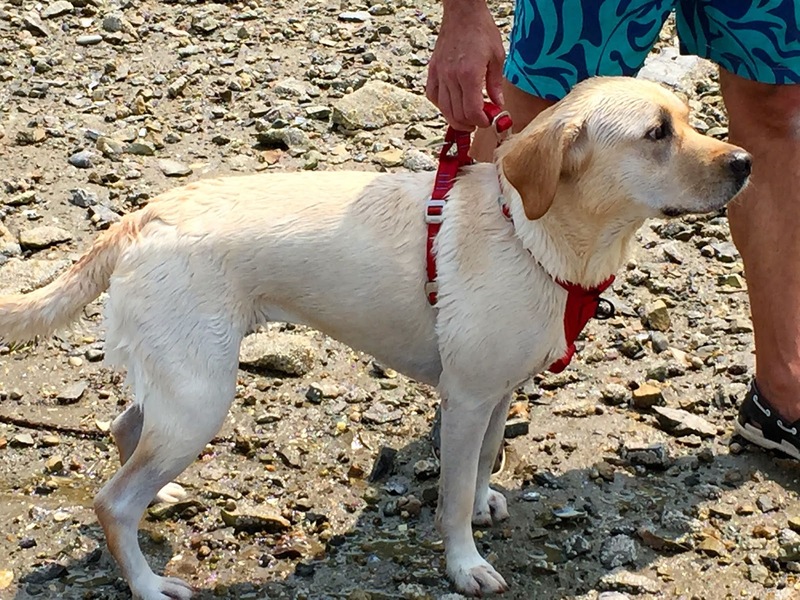 As we learned from our rescue of Dee Dee, a harness that becomes too loose will not serve its purpose when you need it most. However, a harness that is not comfortable will mean an unhappy crew and is less likely to be used. Both companies' websites had sizing charts that provided information about the dog's weight, girth/chest, and/or neck measurements. We dutifully took out the tape measure and made careful measurements. This is where things first began to get interesting. It became obvious that we were not going to find a "one-size fits all" sort of harness. 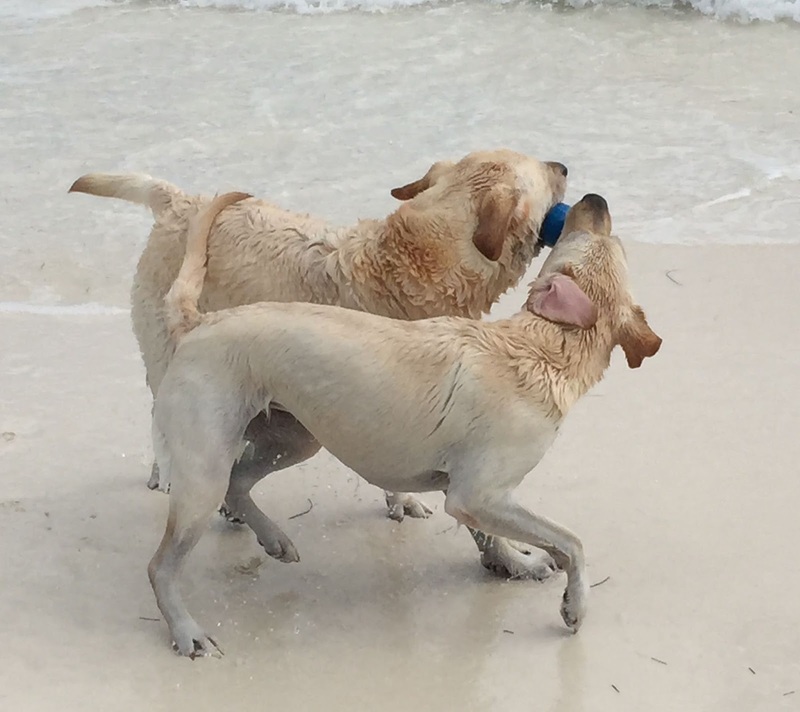 Even though we had two dogs of the same breed who were closely related, we found significant differences. Check out those 6-pack abs! The first harness we received was the RuffWear Web Master which has 3 straps: one around the neck and two around the torso. I immediately ran into a problem fitting the backmost strap. Labs are very deep chested dogs. Looking at them from the side you can see how the chest is large but then the belly curves sharply upward. The problem was fitting the back strap for all day use. I found that if I made it snug when Dylan and Dee Dee were standing up, it would dig into them when they sat. If I loosened it to be comfortable sitting, it hung loose when they stood up. I finally selected what I hoped was a good in-between fit. 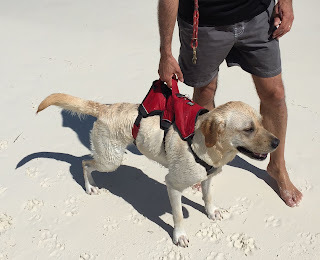 Next we tried the RuffWear Front Range Harness on Dee Dee. 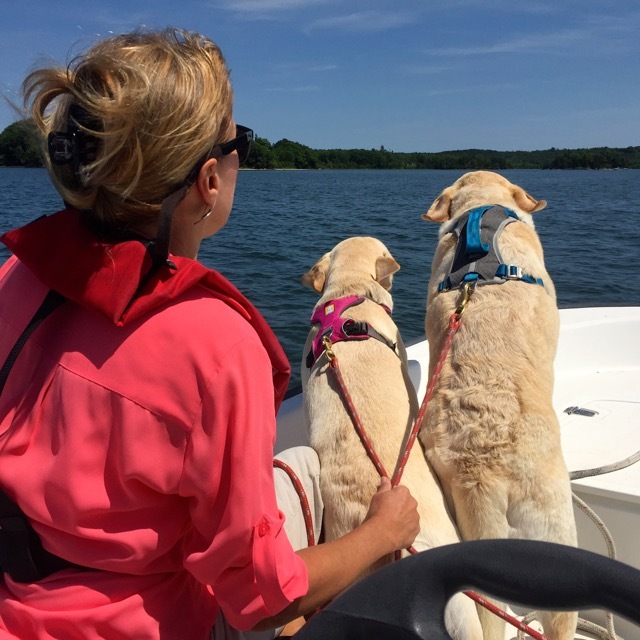 The Front Range Harness is what they call their every day harness designed to be comfortable and used for walking. I selected the size based on the chart and this harness fit like a glove. The only thing I didn't like was the absence of a traffic/safety loop on the back but more on that later. We turned to the two Kurgo harnesses. Dylan fell between sizes so we obtained a large and an x-large for the Tru-fit and a large for the Pinnacle harness. For Dee Dee we received two large harnesses. The large harnesses fit Dylan perfectly. Dee Dee turned out to be more of a challenge (is anyone surprised?). All four harnesses adjusted easily and at first seemed to offer a good fit. However, Dee Dee's harnesses kept riding up on her back. After several attempts to readjust the harness, we determined that because of Dee Dee's small size, the girth strap was not hitting her on the chest. Instead it was coming across her belly and because of that sharp curve it would ride up to her chest creating a big pucker on her back. The length of the harness was just too long for her. So we got another Pinnacle and another Tru-fit harness in medium for Dee Dee. This solved the length issue as the girth strap now fell nicely across her chest. Unfortunately, the girth strap was too tight on both harnesses. On the Pinnacle, the girth strap is sewn into the chest and back plates, so that eliminated that harness for Dee Dee. Fortunately, they designed the Tru-fit so that the girth strap could be interchanged. Perfect. We took the medium harness and replaced the girth strap with the strap from the large harness and had a perfect fit for Dee Dee. Kurgo Customer Service told me that they will work with dog owners in these situations to help obtain a good fit. 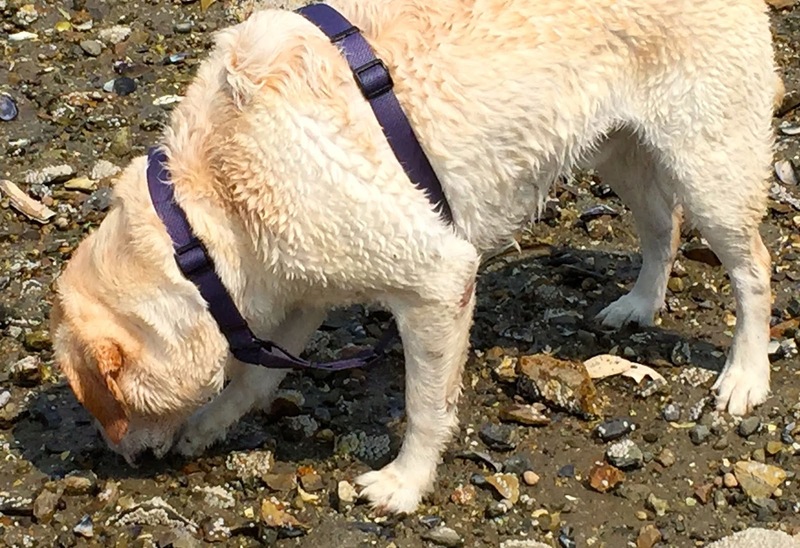 The lesson I learned is that a dog is more than just a weight or a girth. It would have been helpful to have more measurements such as the lengths of the back and belly pieces. When you are looking for a harness, consider all of the dimensions of your dog as well. You want something that will fit snugly but comfortably and that will stay in place especially when you are lifting them. Make sure you can easily return what you purchase and if unsure consider getting two different sizes to try. Now we had several good fitting harnesses, it was time to have the crew put them to the test. We'll let you know what we found next time. Since that time we have looked into numerous safety devices to help should we ever see a repeat performance. Honestly, will she ever stop keeping us on our toes? Would we want her to? We have still not found the right solution for an alarm to alert us should one of the crew go overboard. Jeff is following the developments of an interesting new product under development and will report when more info is available. The existing hunting and pool alarms have all been evaluated and are all missing some features that are important on a boat, especially when it is moving. In the meantime we have spent months testing different safety harnesses. 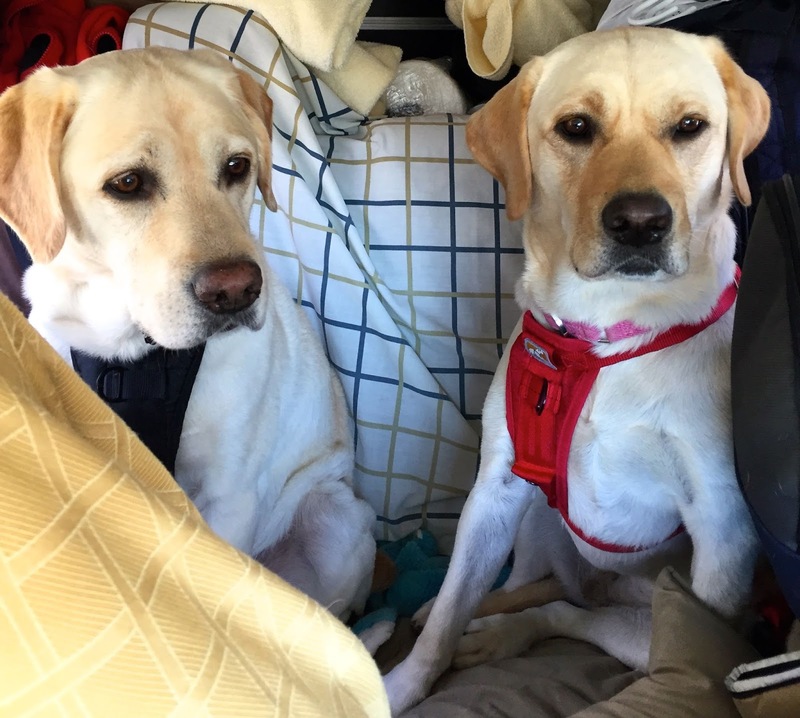 Dylan and Dee Dee have worked hard swimming, running, chasing the bumper, and other tasks needed for this important study. As I've stated before, they are one hardworking crew. This will be the first of several installments detailing what we (they) found. Our first task was to figure out why the Kong harnesses that we have been using for years failed during Dee Dee's rescue. We had used these harnesses successfully to pull both Dyna and Dylan back into the dinghy following their various attempts at adventure. Of course, they had spent much briefer times in the water. We felt it was important to understand what actually failed before we could move forward. I spoke to several manufacturers who agreed that it was most likely due to the strap material stretching when it became wet. We tested this extensively and were quite surprised to discover that stretching was definitely not the problem. All of the harnesses we tested, except the PFD's, showed minor stretching but not enough to prevent successful use of the harness. It turns out that on the Kong, the safety buckle failed. When the harness becomes wet, it gives out and slides down the strap opening it up significantly. The picture above was taken of Dylan after only two bumper retrievals. The belly strap hangs down 2-3 inches. We were able to replicate consistently. 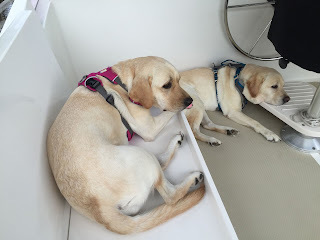 That discovery actually made us more comfortable using standard dog harnesses on the boat. 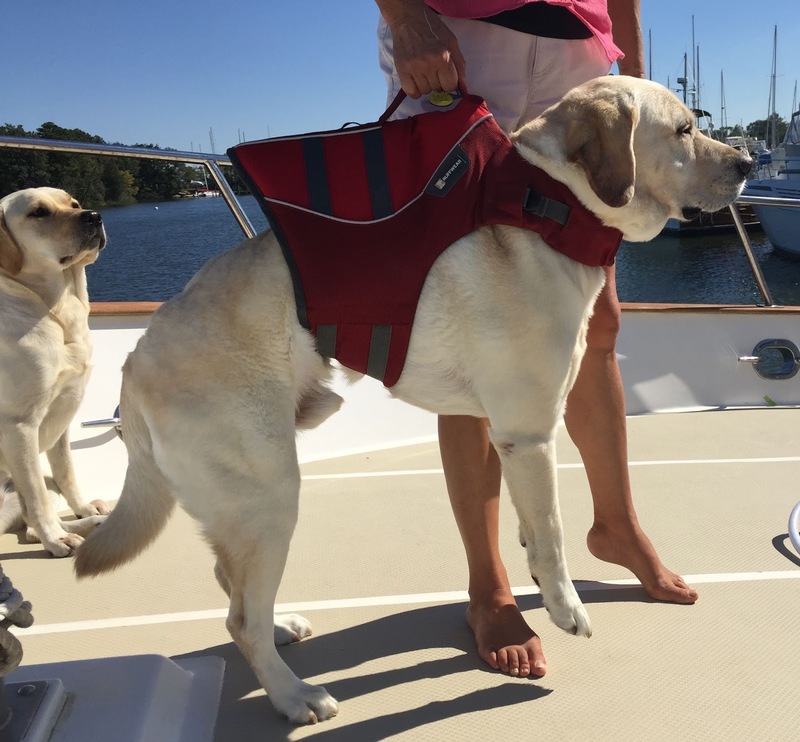 Of course we'd still like to see harnesses made with the same waterproof webbing used on the canine PFD's to prevent any stretching at all. Many of you wrote us with suggestions about harness options - too many for us to test. Although Dylan and Dee Dee said if more swimming and romping were required, they were willing to make the sacrifice of additional testing. We selected several harnesses from RuffWear and Kurgo both makers of quality products for dogs on the go - that certainly describes Dylan and Dee Dee. Then the crew went to work. 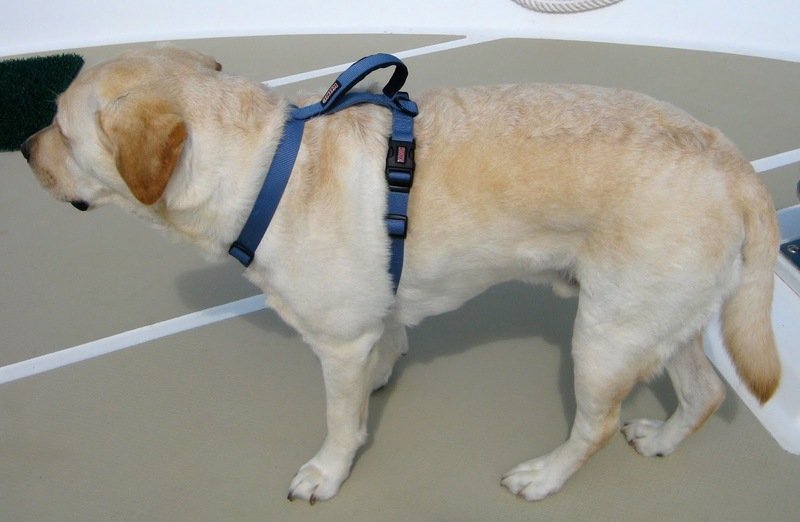 Our major finding is that there is no such thing as the perfect harness. It's important to have quality options because you won't find a "one size fits all" solution. Each crew member is unique and the fit that might work for Dylan or Dee Dee may not work for your bundle of joy. In fact, as you'll see, what worked for Dylan didn't actually work for Dee Dee, but that's getting ahead of things. 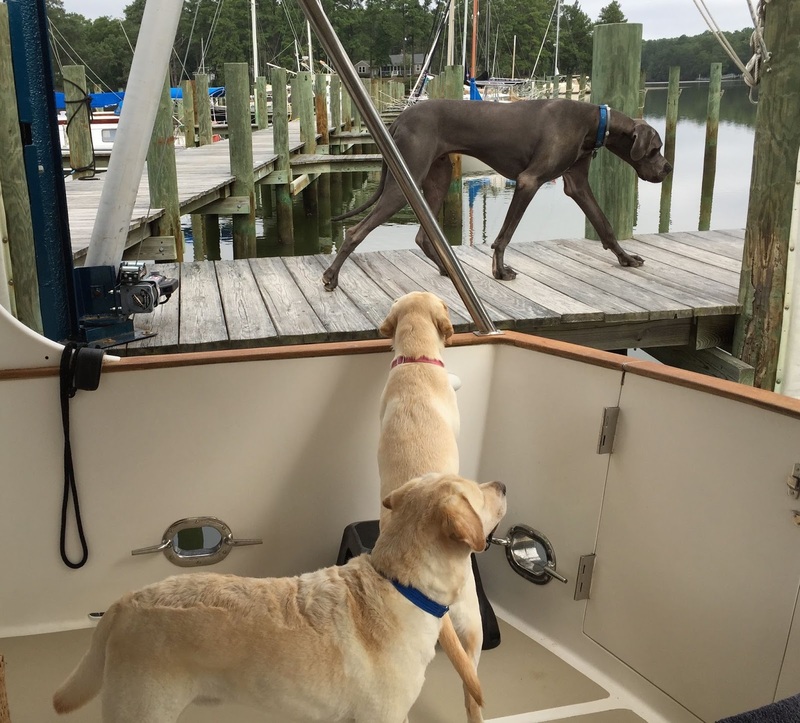 Our goal is to educate cruising dog owners about the issues we encountered and the discoveries we made. Ultimately, what's most important is safety onboard and that includes our four-footed crew members. 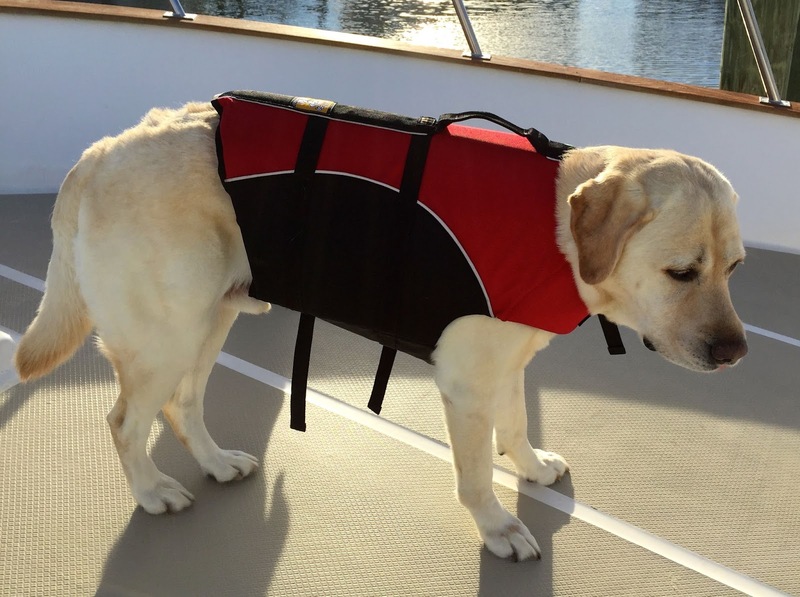 It is important to point out that the safest option for your canine crew is a canine life vest. 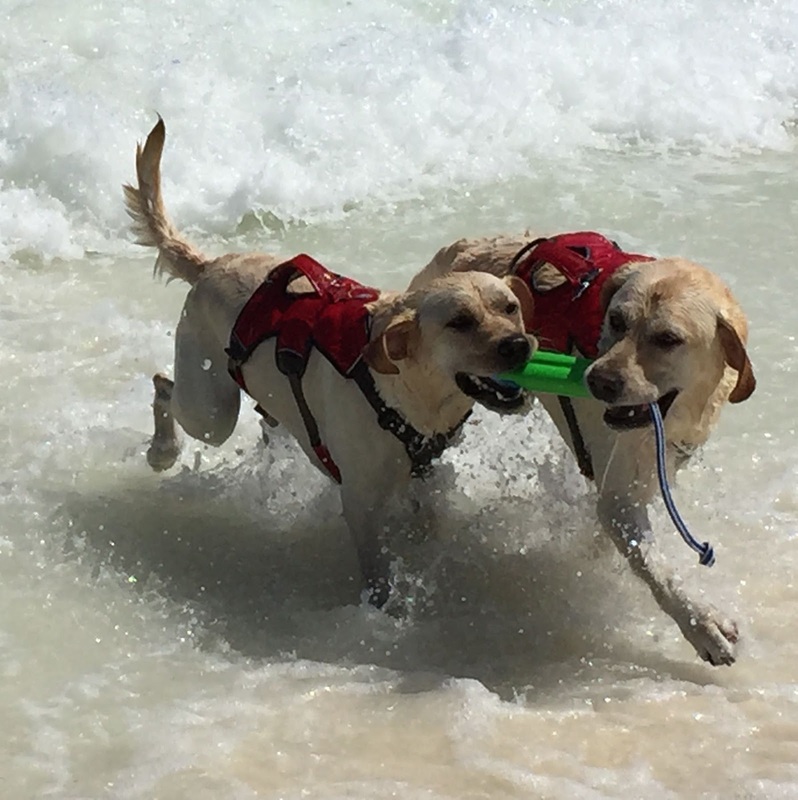 We carry life vests onboard for both Dylan and Dee Dee. Their vests are stored along with ours and the rule is that if we don ours, they don theirs. 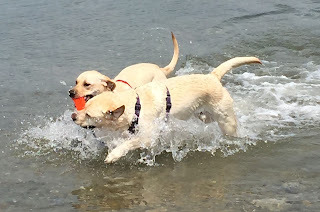 It is a decision we are comfortable with as Labs are terrific swimmers. However, you may decide differently for your canine crew based on their abilities and comfort levels. In the next blog entry we'll look at what we discovered when attempting to find the right fit among a variety of harnesses from different manufacturers. I love animals, all animals. I can't look into the eyes of one without knowing they have as much of a soul as I do. It's one reason why we are Vegan - don't worry no soapbox here. Sometimes you meet a soul that just grabs your heart and squeezes it. This weekend the crew met Ky. 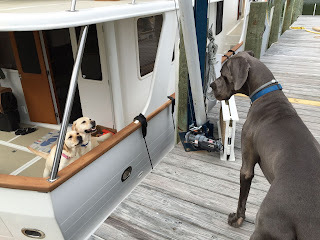 When we pulled into Yankee Point Marina off the Corrotomon River in Virginia we were met by owners Karen and Ken, several other boaters, and Ky. We learned that Ky was a rescue who had been terribly mistreated by his first owner, lived in less than ideal circumstances with his second, and then won the jackpot with Karen and Ken. Ky is 16 or 18 months old (I don't quite remember). He weighs 170 pounds and is still growing. The vet told them to expect him to finish somewhere around 200. His paws are so big that visiting boaters have asked if there were bears in the area because they just spotted the tracks. It only took one look into those beautiful eyes and I was smitten. He is sweet and funny and very affectionate. And don't you dare tell him he's not a lap dog. Dylan and Dee Dee enjoyed an afternoon romp. Unfortunately, I forgot the phone for pictures. Dee Dee could run right under his belly to grab the stick. They all had a wonderful time and Dylan and Dee Dee were even able to coax Ky into the river. He didn't exactly take a swim but with those legs he could wade far out. 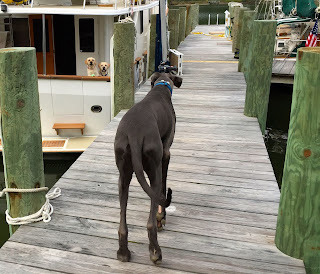 The morning we left Ky came out to the dock to say goodbye. The crew sniffed and woofed and obviously wanted to play. Ky helped us get ready and then finally headed back to his job helping his mom and dad run the marina. He was so handsome as he loped down the dock. Goodbye, Ky. We all look forward to seeing you again.